For the thrash metal band, see Exodus (band). Exodus is the second book in the Torah, or Books of Moses. Exodus in Hebrew is called Shmowt, which means "names." Exodus means 'going out' in Latin. It is about how the Hebrew people were led out of Egypt by God. Moses, their leader, hears God's words and in turn tells the Israelites. Exodus ends with God's laws and his instructions on how to build a holy container called the Ark of the Covenant. After the Hebrews went to Egypt to get food, the old Pharaoh died and a new Pharaoh came to power and made each Hebrew a slave. The Pharaoh made the Hebrews work for them very hard, and told his soldiers to throw their babies into the Nile River. A baby; Moses, who was put in a reed basket set adrift on the Nile and later rescued by an Egyptian princess, grew up in Pharaoh's palace, later killed an Egyptian slave-driver. He escaped from Egypt and lived away from his people in Midian for Jethro, his father-in-law. One day, while Moses was tending his flocks, God appeared in a burning bush to Moses and instructed him to lead the Israelites out of Egypt. As Moses had no confidence in doing this task, God gives him his brother Aaron to help him. Aaron was a good talker and helped Moses speak to the Pharaoh. When he returned to Egypt, Moses asked the Pharaoh to let the Israelites go, but the Pharaoh refused. Through God's power, Moses causes ten plagues to come on Egypt. The last plague was the death of all the firstborns in Egypt. Only the Israelites' firstborns were spared, as they had the blood of a young lamb on their door, so God did not let the Angel of Death enter their houses (12:23) The Pharaoh finally decided to let the Israelites go. While the Israelites were crossing the Red Sea, the Pharaoh changed his mind and decided to pursue them with his troops. The Israelites passed safely as Moses parted the Sea with his staff by God's power but once they all passed the sea closed, leaving all the Pharaoh's troops to drown. 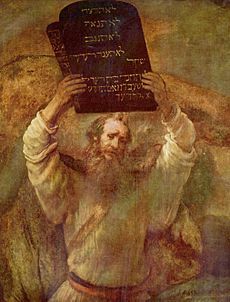 Later, at Mount Sinai, Moses received the law and the Ten Commandments from God. The Israelites, however, sinned against God by worshiping an idol (a golden calf). Moses broke the first two stone tablets of the Ten Commandments in anger. God later gave him another two. He also told Moses how to build the Ark of the Covenant. The book has been filmed several times, as The Ten Commandments and The Prince of Egypt. Exodus Facts for Kids. Kiddle Encyclopedia.